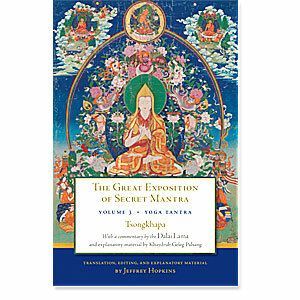 Yoga Tantra is the third volume in The Great Exposition of Secret Mantra series, in which the Dalai Lama offers illuminating commentary on Tsongkhapa’s seminal text on Buddhist tantra. It is preceded by Volume I: Tantra in Tibet and Volume II: Deity Yoga. The Dalai Lama opens the door to the topic of Yoga Tantra with an extraordinarily detailed teaching on a classic text. Rarely in the Dalai Lama's lifetime has he given teachings of such a nature on this topic. There follows a translation of the Yoga Tantra section of Dzong-ka-ba'sThe Great Exposition of Secret Mantra, one of his most important works and a monument of Tibetan Buddhist literature. Jeffrey Hopkins concludes this book with an outline of the steps of Yoga Tantra practice. This is an invaluable book for anyone who is practicing or interested in Buddhist tantra in general. This is the third book in a series presenting The Great Exposition of Secret Mantra. The first two books were Tantra in Tibet and Deity Yoga. Tantra in Tibet, part one of The Great Exposition, describes the differences between the Lesser and Great Vehicles and between the Sutra and Mantra Great Vehicles. Deity Yoga, parts two and three of The Great Exposition, presents Action Tantra and Performance Tantra. Paperback, 2017 edition, 240 pages.